In these tough economic times, when adding a new office employee could dramatically affect your bottom line, it is essential to have the tools available to enable your existing staff to be as productive as possible. We at Nickerson Business Systems believe that the capabilities of your enterprise accounting system and the training and long-term support behind it are the keys to achieving this goal. Small firms such as ours exist due to the demand for quality service. And, quite honestly, it is usually the owners of other small companies that recognize the benefits of a close relationship with other highly skilled, highly motivated small-businessmen. Our job is to provide you with those productivity tools and to make computerizing your company an enjoyable experience. Our method is simple. We take charge of getting you up and running. This includes systems analysis, data analysis and conversion, forms analysis and design, fine-tune programming, classroom training, one-on-one training, arranging for local convenient hardware maintenance, and providing ongoing personalized support. And because of our years of experience, we have organized the whole process to insure little disruption to your current operations. The foundation of our productivity tools is our Encore Distribution Accounting and Management Information System. 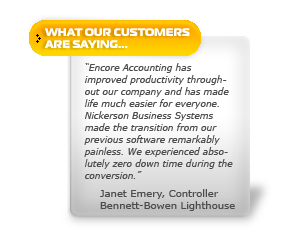 Please review our Software page for more information on Encore Accounting. 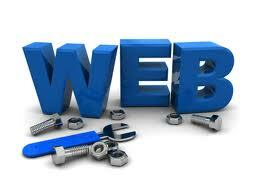 These days establishing and maintaining a professional looking web presence is more important than ever. Our development team knows the importance of first impressions and will tailor a site that will put your best foot forward. At Nickerson Business systems we not only create eye-catching professional looking websites, but we can also design one that uses state-of-the-art technology to insure that search engines will rank your site so that your target audience can find you. Weather you're looking to create an online store or simply promote your product and services, we can get the job done. 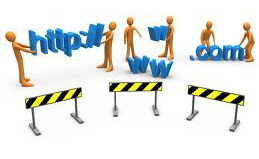 Custom online applications are growing in popularity. 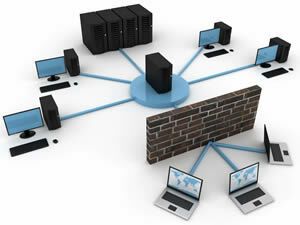 The biggest software companies in the world have already begun rewriting their desktop apps to run in the "cloud". There are many advantages to designing web-based apps. One of the biggest advantages is that they are operating system agnostic. Whether you're running a MaC, PC, a Unix/Linux box or a smart phone, all you really need is a browser. Many companies are now hiring firms like Nickerson Business Systems to customize web based solutions to improve interoffice communication and provide an easier way to disseminate information to their customers and vendors as well as salespeople and techs in the field. Let us design an app for you. Bar Coding - Customer compliant shipping labels, inventory control, forms processing, etc..
Our Unix, Linux, and Windows servers are configured to fit our customers' needs and are built to last for years and years. Nickerson Business Systems believes that the mission critical application that actually runs your company's operations MUST reside on the most dependable server available. As a result, its not uncommon to hear that some of our machines have been running for years at a time without requiring rebooting.